Today sees the opening of artist and poet Alec Finlay’s gathering at WORM, the gallery/project space of Peacock Visual Arts, Aberdeen. The exhibition (which is open to the public from tomorrow 5 April 2019), brings together Finlay’s recent place-aware projects, from gathering; a mapping of the Cairngorms in poems, essays, photographs, and maps, created for The Fife Arms, Braemar (commissioned by Hauser & Wirth); a wolf among men a man among wolves, detailing innovative woodland remediation at Mar lodge and humandwolves at Trees for Life, Dundreggan, commissioned by Common Ground; Wild City, a survey of wild nature and the potential of urban rewilding, in Glasgow; and Hutopianism, celebrating the hut and bothy movement, from an installation at the 2018 Venice Architecture Biennale. gathering is said to be Finlay’s most ambitious project to date with regard the flourishing interest in reading the Gaelic landscape. Allying this movement to hutopianism, rewilding, stewardship, and the right to care for the environment, engaging in pressing debates that impact on sustainability and climate breakdown, he is also presenting a new screenprint, Rewilding Timeline, which represents the first summary of the movement’s evolution in Scotland, from the 18th century to today. This and other works are accompanied by photographs as part of his collaboration with Hannah Devereux and Mhairi Law, too. 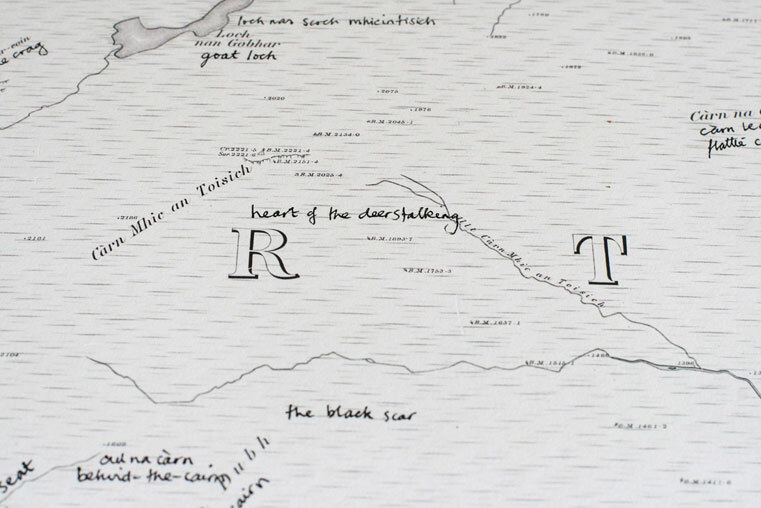 Alec Finlay, place-aware map of Dundreggan estate, English versions of Gaelic place-names, along with local toponyms collected from the community commissioned for Trees for Life Dundreggan Estate. In the nineteenth century, everything in every direction was owned by the Duke of Sutherland, and while the Sutherland Estates still own great swathes of the great bog there are newcomers such as Andreas Holch Povlson, who owns 222,000 acres of Scotland, including the 24,000-acre Ben Loyal estate, the 18,000-acre Kinloch Lodge and the 18,000-acre Eriboll estate. In total he owns 11 Scottish estates. In fact Mr Povlson [best known in Scotland for his extensive rewilding programme] is the living proof that if you have enough money in Scotland you can buy what you want and do what you want. He cannot do this in Denmark where there are strict laws concerning agricultural ground, residency and land use. Ownership in Scandinavian countries is viewed as a social activity and has to have a societal benefit because good land is so scarce. Also this is a cultural philosophy where under udal law property was shared, not hoarded. Wealth needed to be distributed or the society would fall apart. Setting aside the rights and responsibilities of ownership, anyone dedicated to ‘the hill’ enters a complex ecosystem. In the span of mountain-time all is change: we walk upon habitats, but the hill is no static reality. 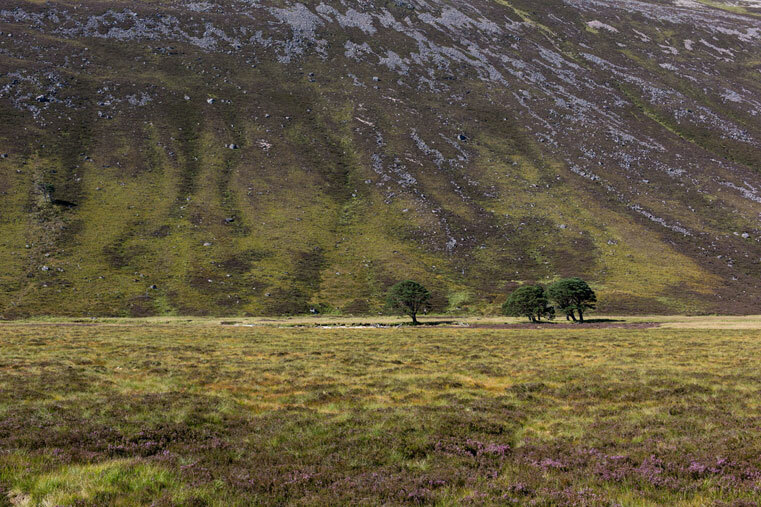 Estates cover vast tracts of land, though in terms of the clans each glen was usually divided-up between septs. Those who would divest sporting interests of their purchased right to leisure must consider what becomes of the land? Anders Holch Povlsen […] has reduced the deer population on Feshie to 1 per square km, rewilding the glen. When the scale of ‘wild’ land and the population to care for it are out of proportion, and have been for decades, or centuries, then there are no easy answers. The welcome innovation of the community buy-out depends on there being a community present, and their having the confidence – itself a form of access. Ecological solutions tend to be microtonal – community woodlands, islands of Scots pine connecting relic Caledonian Pine-forest, the knowledge shared by a place-aware mountain guide, a bothy with berths for a half dozen, or a new community hydro scheme, such as Corriemulzie, which went online in May. Opinion is clearly divided on the political aspects of the matter, for sure, but there is also a commonality of interest in some respects, and this is something that Finlay’s works clearly addresses. His output is prolific in this regard, his research thorough and unstinting, and his exhibition certainly worthy of wide coverage and sustained interest, not just in its present form, but in the directions it will take him next. If nothing else, it represents a point of reflection (for ourselves and its maker/collaborators). From that reflection comes knowledge, and from knowledge comes power and the confidence he alludes to with regard the wider community. 10am – 5pm, Tuesday – Saturday. Alec Finlay will read from recent work at the private view, April 4th, and at the artist talk, April 6th, which will include contributions from Nuno Sacramento and Jo Vergunst.